On August 21 2014, me (Kewl) and Joter85 started with Crypto-Games.net. Basically, it was an upgraded version of DogecoinMachine.net, only it included Bitcoin and Litecoin in addition to Dogecoin. We knew we would add more games, so we did not include “slot” or “slot machine” in the domain name. The picture above shows the original front page. 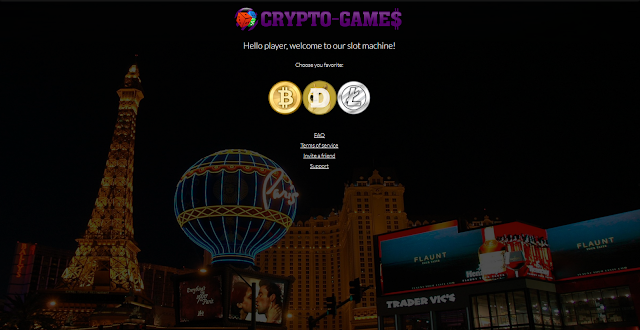 Looking at it now, it feels like something is missing :) We were and still are adding new things almost every day to make Crypto-Games better and to offer a greater gambling experience. Soon after launch, we added a simple Dice game without autobot and then slowly added features, games, and coins. We would like to thank our moderators; we couldn't do this without you guys! Some of the moderators said goodbye, some joined our team not so long ago. The current team is composed of Lutpin, Accountant, DemiGod, Void3999, Hohen, and recently less active Adzino and Juan. We're growing slowly but steadily. This is evident in our increases in daily visitors, wagered amount, investments, number of bets, the number of maximum players at the same time, and so on. If you missed the celebration, you can still receive free Bitcoins if you're at least Jr. Member on the Bitcointalk forum, and if your Crypto-Games account is at least 10 days old or you have wagered more than 2 Bitcoins. Here's the bitcointalk thread. As always - catch the winning spirit!